First, I just mixed brown and white sugar together and added the melted butter and mixed until it reached a smooth consistency. I mixed in one egg at a time and then added the vanilla. Then, I mixed the flour, baking soda and salt. The recipe called for a teaspoon of salt but a lot of people suggested using less salt because so I ended up using just half a teaspoon. After that I slowly mixed in the flour concoction into the sugar/butter and mixed until I reached a relatively smooth consistency. I didn’t want to overdo the mixing because that usually causes the cookies to flatten. Lastly, I added the oats, chopped walnuts and chocolate chips. 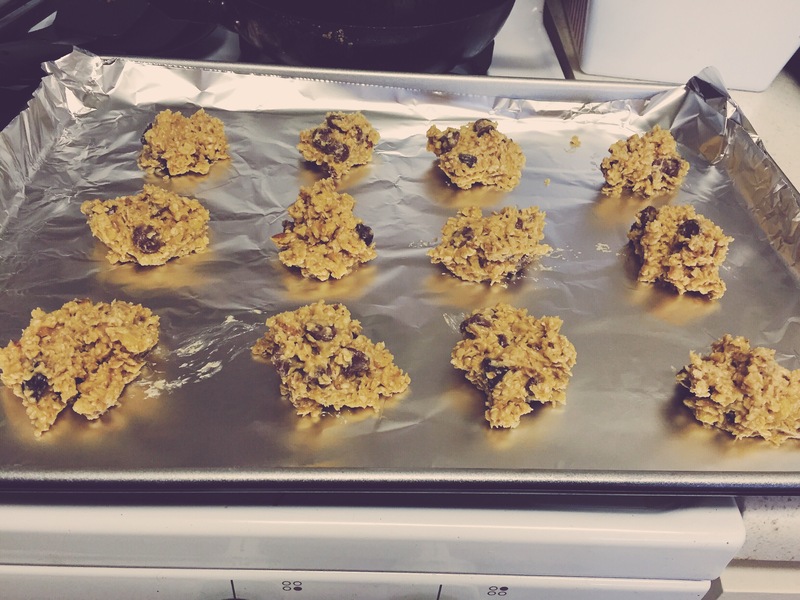 The recipe called for semi-sweet but I also added some milk chocolate chips since my family is a fan of all things milk chocolate (and I’m already asking a lot by forcing oatmeal cookies on them). I scooped the cookie batter into a tablespoon and placed it on a foil covered baking sheet about an inch apart. Don’t grease the pan! It’s not necessary at all. The oven was preheated at 325 and the recipe asked to bake the cookies for about 12 minutes but I actually ended up baking for almost 18. I think this is probably because my ‘scoops’ were a bit larger than the recipe called for and our baking sheets are actually pretty thick so it took longer for the cookies to bake. The recipe said it makes about 3.5 dozen and I only ended up with 3 so that may also explain why it took longer to bake. Because these were meant to be gifts for both my family and my husband’s family, I decided to channel my inner 5-year-old and break out the markers and the colored pencils! We’ve learned the hard way that the best way to give food to our relatives is in disposable foil trays. Our kitchen is relatively small so we only have as many dishes as we use on a regular basis and we usually end up leaving bowls, etc at other peoples’ houses and then are in trouble when trying to store leftovers. So I picked up a few foil trays this morning and I taped this sign over the foil on top. Can definitely work on the presentation in the future but it’s the thought that counts, right? To those observing the Eid holiday tomorrow (or within the next couple days), Eid Mubarak! We hope you all have a wonderful day with your family and friends. 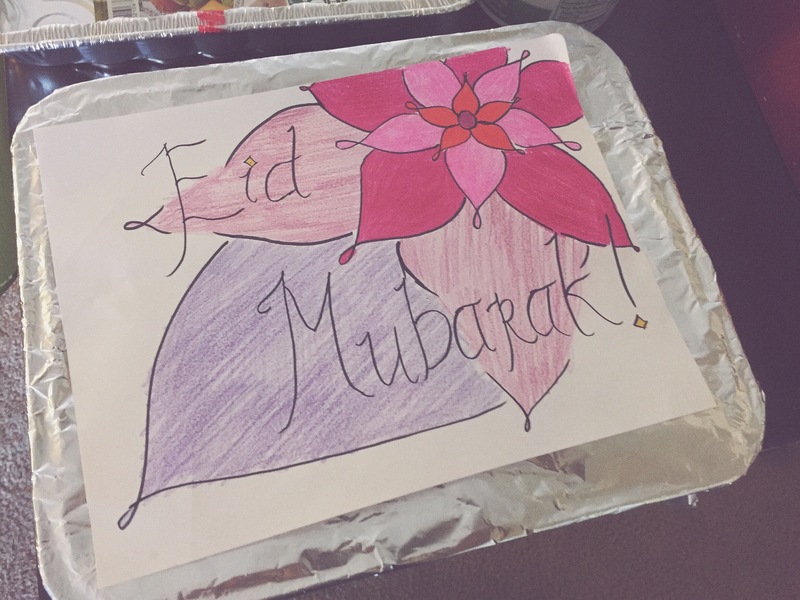 What Eid traditions do you have in your family? If you know of anyone who may be celebrating alone, please invite them over! And to everyone else, I hope you have a wonderful weekend! Update: the cookies turned out pretty pretty yummy! They were a bit dry probably because I baked them for a bit too long. Definitely going to use this recipe again! Haha yeah, that does get confusing but I feel like things less confusing than a couple years ago!